I try finding answers on these produce of nature, GOOGLE, WIKIPEDIA or whatever!! 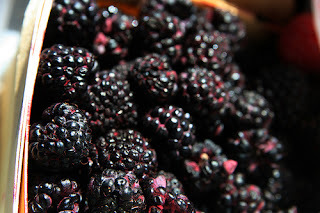 Black raspberries may help prevent bowel cancer (hell yea), new research suggests. Scientists found that a freeze-dried version of the fruit could reduce the number of tumours in a The incidence of bowel tumours was cut by 45%.Previous research had indicated that black raspberries have antioxidant and anti-cancer properties. In the study, the fruit inhibited tumour development by suppressing a protein called beta-catenin. Tumour incidence and numbers were both reduced by 50% in another strain of mouse vulnerable to colitis, an inflammation of the large intestine that can contribute to bowel cancer. Both mouse strains were either fed a Western-style, high fat diet, or the same diet supplemented with 10% freeze-dried black raspberry powder for 12 weeks. Scientists saw a broad range of protective effects in the bowels of the mice given the supplement.strain of mice prone to the disease by 60%. well, the bad thing about it is...u may not understand what does all this mean. I shall say,,HEY just ask me!! No one stops learning-each day, minutes and seconds teaches us new things in our daily living. God Bless You "Bon Apetite"